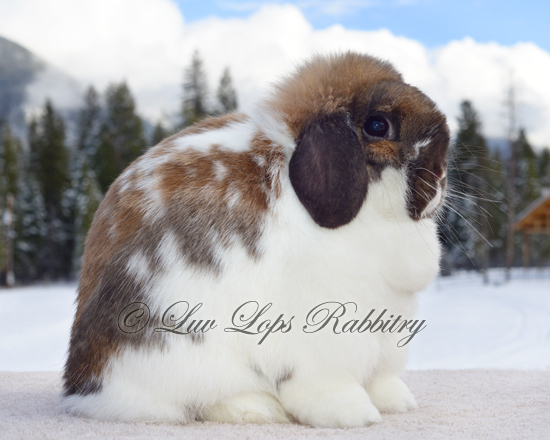 The 2011-2015 ARBA SOP Holland Lop photo. Senior Bucks and Does–6 months of age & over, weight not over 4 pounds. Junior Bucks and Does–Under 6 months of age. Minimum weight 2 pounds. NOTE: No animal may be shown in a higher age classification than its true age. All colors are to be shown as Solid or Broken Pattern. Recognized colors within a group are not to be judged separately. 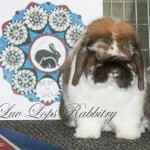 NOTE: Holland Lops should be posed with the front feet resting lightly on the table. When ideally posed and viewed from the front, the head should be carried high on the shoulders, and close to the shoulders, exposing a deep, well filled chest and short, thick front legs. Holland Lops should not be pushed down with the forelegs flat on the table. 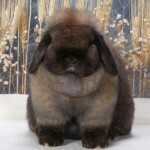 Holland Lops are generally of an excitable nature and will often exhibit poor ear carriage when being handled on the show table. In order to properly evaluate an animal’s ear carriage, the animal should be allowed to relax. BODY–Points 32: The general aspect of the body is short, massive, and thick set. The shoulders and chest should be broad and well filled. The shoulders should be deep, with the depth exhibited at the shoulders of an ideally posed animal being carried back to hindquarters of equal or slightly greater depth. The width of the shoulders should be nearly equal to, but not exceed the width of the hindquarters. The hindquarters should be broad, deep, well rounded, and well filled to the lower portions. The animals is to be heavily muscled, short-coupled, compact, and well balanced is length, width, and depth. 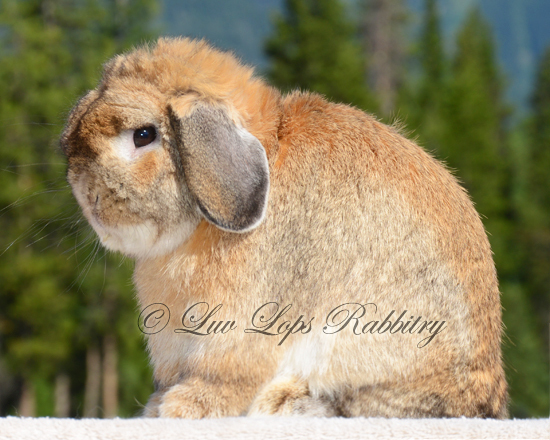 A small, simple dewlap is permitted in does. Faults–Lacking depth throughout the body; long, low or narrow shoulders; chopped, pinched, or undercut hindquarters flatness over the hips; large dewlap in does. Fault severely for long or narrow body. HEAD–Points 24: When viewed from the front, the head is to have good width, which begins at the base of the ears and carries down between the eyes to an extremely short and well filled muzzle. When viewed from the side, the head is round from the base of the ears, to a slight flattening between the eyes and the muzzle and then to continue rounding from the lower portion to the muzzle to the neck. The eye is to be bold and deep set. The head is to be massive in appearance and set high and close to the shoulders. The size of the head is to be in proportion to the size of the body. Faults–Pinched muzzle; narrowness between the eyes; head too small to balance with the body. Fault severely for narrow or long head. EARS–Points 10: The ears should lop vertically on both sides of the head from a strongly defined and properly positioned crown. The ears should hang close to the cheeks, with the openings turned towards the head. When viewed from the front, the outline of the ears and crown should resemble a horseshoe shape. 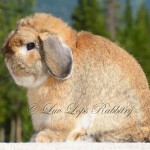 The ears should be thick, well furred, wide and well rounded at the tips. The ears should hang just behind the eyes and extend no more than 1 inch below the jaw line. Ear length and width should balance with the size of the head and body. Faults–Pointed, narrow, thin or folded ear; poor ear carriage or placement; ear length which does not balance with the size of the animal. BONE, FEET & LEGS–Points 10: The legs are to be short, thick, straight an heavily boned fro the size of the animal. White toenails are preferred on Broken Pattern animals. Broken Patterned animals are not to be disqualified for colored or mismatched toenails. Faults–Colored or mismatched toenails on Broken patterned animals. Fault severely for long legs, narrow legs, or fine bone. Disqualifications from Competition–General toenail disqualifications apply on Solid Pattern animals. General toenail disqualifications, except toenail color, apply on Broken Pattern animals. FUR–Points 7: (Rollback) The fur is to be glossy, dense, fine in texture, and uniform in length. 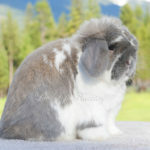 The fur is to be approximately 1 inch in length and is to gradually roll back into normal position when it is stroked from the hindquarters to the shoulders. 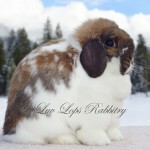 COLOR & MARKINGS–Points 4: All colors should conform to one of the recognized Holland Lop Color Guide descriptions. The Solid pattern classification includes all recognized colors within the recognized groups. The Broken pattern classification includes all recognized colors within the recognized groups in combination with white. Broken pattern animals–Unbalanced nose markings; white on one or both ears, incomplete eye circles, uneven pattern distribution. Solid pattern animals–Faults are as specified under each color description. 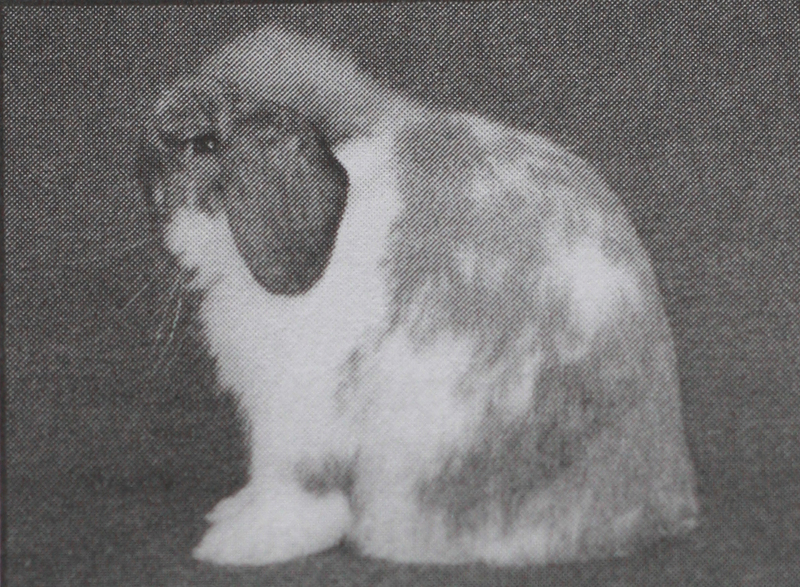 Disqualifications from Competition–Broken pattern animals–The complete absence of nose markings, absence of color on one or both ears, absence of color around one or both eyes. Eye color other than specified in the color description. CONDITION–Points 5: Per ARBA definition.